Joe Lauriantis is the brother of John Lauriantis (aka Johnny Ace) and Mark Laurenitis (aka The Terminator)..
Joe Lauriantis has wrestled as “Animal” most of his career, teaming with Hawk as “The Road Warriors” or “Legion of Doom”..
October 23, 1983–The Last Battle of Atlanta: Jimmy Valiant & Pez Whatley vs The Road Warriors ended in a double disqualification..
June 30, 1984–FLORIDA Lords of the Ring: Barry Windham & Mike Rotunda (US Tag Champions) beat The Road Warriors by disqualification..
May 21, 1985–Owen Promotions 60th Anniversary Show: Larry & Curt Hennig defeated The Road Warriors by disqualification..
July 6, 1985 – Great American Bash: Krusher Khruschev & Ivan Koloff vs The Road Warriors ended in a double disqualification..
February 2, 1986–MoscaMania: Road Warriors defeated Nikita Koloff & Baron von Raschke..
February 14, 1986–FLORIDA Battle of the Belts II: The Road Warriors & Blackjack Mulligan vs Kevin Sullivan & Mark Lewin & Maya Singh ended in a Double Count Out..
September 1, 1986 – FLORIDA Battle of the Belts III: The Road Warriors vs Ed Gantner & Kareem Muhammad ended in a double disqualification. May 9, 1987–FLORIDA Eddie Graham Memorial: Rick Rude & Manny Fernandez vs The Road Warriors ended in a Double disqualification..
September 20, 1987 – WWC 14th Anniversary: The Road Warriors vs Terry & Dory Funk Jr. ended in a double disqualification..
November 26, 1987 – Starrcade: Arn Anderson & Tully Blanchard defeated The Road Warriors by disqualification..
December 26, 1988 – Starrcade: Dusty Rhodes & Sting beat The Road Warriors by disqualification (Warriors retain Tag titles)..
February 15, 1989 – NWA Clash: Road Warriors & Genichiro Tenryu vs Varsity Club (Rotunda/Sullivan/Williams) double disqualification..
October 28, 1989 – Halloween Havoc: The Road Warriors defeated The Skyscrapers (Sid Vicious & Dan Spivey) by disqualification..
February 6, 1990 – NWA Clash: The Skyscrapers (Mark Callous & Dan Spivey) defeated Road Warriors by disqualification..
April 21, 1990: The Road Warriors defeated Doom (Ron Simmons and Butch Reed)..
May 19, 1990 – Capitol Combat: The Road Warriors & Norman The Lunatic beat Bam Bam Bigelow & Kevin Sullivan & Cactus Jack..
October 3, 1991 – Royal Albert Hall: The Legion of Doom defeated Hercules & Paul Roma to retain the tag team titles. January 19, 1992 – Royal Rumble: The Natural Disasters (Earthquake and Typhoon) defeated The Legion of Doom by Count Out..
April, 19, 1992 – UK Rampage: The Legion of Doom defeated Col. Mustafa & Dino Bravo. July 23, 1992 – House Show: Animal defeated Repo Man. October 2, 1992 – House Show: Animal and Crush defeated The Beverly Brothers. October 2, 1992 – House Show: Animal and Crush defeated Kato and Skinner. October 8-11, 1992 – House Show: Animal defeated Double Trouble in a handicap match. October 16, 1992 – House Show: Animal defeated Papa Shango. Animal injured his back and began collecting on his Lloyds of London insurance policy..
January 29, 1996 – WCW Monday NITRO: The Road Warriors defeated The Faces of Fear..
February 5, 1996 – WCW Monday NITRO: Sting & Lex Luger defeated The Road Warriors to retain the Tag Team titles..
February 11, 1996 – WCW Monday NITRO: Sting & Lex Luger battled The Road Warriors to a Double Count Out..
February 26, 1996 – WCW Monday NITRO: The Road Warriors defeated Harlem Heat..
March 10, 1996 – WCW Monday NITRO: The Road Warriors defeated The Steiner Brothers..
March 17, 1996 – WCW Monday NITRO: The Road Warriors defeated The Nasty Boys..
April 1, 1996 – WCW Monday NITRO: The Steiner Brothers defeated The Road Warriors and The Nasty Boys in a Triangle Match..
April 29, 1996 – House Show: Hawk & Animal & The Power Warrior defeated The Steiner Brothers & Scott Norton in Tokyo..
April 29, 1996 – NJPW: Hawk & Animal & The Power Warrior defeated The Steiner Brothers & Scott Norton in Tokyo..
June 10, 1997 – RAW: The Legion of Doom & Ahmed Johnson defeated Faarooq & Crush & Savio Vega..
June 30, 1997 – RAW: Faarooq & D-Lo Brown defeated The Legion of Doom..
September 22, 1997 – RAW: The Legion of Doom defeated Faarooq & Kama Mustafa..
October 5, 1997 – Bad Blood: The Nation (The Rock & Kama & D-Lo Brown) defeated The Legion of Doom..
December 5, 1997 – Saturday Night: The Legion of Doom defeated Frank Parker and Roger Hill. May 11, 1998 – RAW: The Disciples of Apocalypse defeated Hawk in a Handicap match..
June 27, 1998 – Shotgun Saturday Night: LOD 2000 defeated The Midnight Express. July 6, 1998 – RAW: LOD 2000 Hawk vs Darren Drozdov in a Brawl4All match and ended in a draw. August 10, 1998 – RAW: Southern Justice vs LOD 2000 (Animal & Droz) ended in a no contest..
August 16, 1998 – HEAT: Kane and Mankind defeated LOD 2000 to retain the tag team titles. August 23, 1998 – HEAT: European champion D-Lo Brown vs. Road Warrior Animal ended in a no contest. August 30, 1998 – HEAT: Too Much defeated LOD 2000. September 5, 1998 – Raw Saturday Night: The Oddities defeated LOD 2000. September 6, 1998 – HEAT: Kane and The Undertaker defeated LOD 2000. November 1, 1998 – HEAT: The Hardy Boyz defeated LOD 2000. November 15, 1998 – HEAT: Bob Holly and Scorpio defeated LOD 2000. November 16, 1998 – RAW: Edge & Gangrel defeated LOD 2000 (Animal & Droz) by Count Out..
December 6, 1998 – HEAT: LOD 2000 defeated Too Much. December 6, 1998 – Capital Carnage: The Head Bangers defeated LOD 2000. January 2, 1999 – Shotgun Saturday Night: Bob Holly and 2 Cold Scorpio defeated LOD 2000, The Acolytes and The Disciples of Apocalypse in a 4-way tag team match. January 9, 1999 – Shotgun Saturday Night: The Acolytes defeated LOD 2000 by disqualification. March 28, 1999 – HEAT: Animal was in a #1 contenders tag team battle royal for the tag titles won by Test and D-Lo Brown. January 29, 2001 – WCW Monday NITRO: Road Warrior Animal and Chavo Guerrero Jr. defeated Billy Kidman and Rey Mysterio Jr..
February 19, 2001 – WCW Monday NITRO: Billy Kidman and Konnan defeated Road Warrior Animal and Chavo Guerrero Jr..
March 21, 2001 – Thunder: MI Smooth and The Cat defeated Road Warrior Animal and Kanyon. January 8, 2003 – NWA:TNA: Jeff Jarrett & Road warriors are attacked by S.E.X. but are saved by the surprise Dusty Rhodes! January 15, 2003 – NWA:TNA: Vince Russo/Low Ki/Chris Daniels/Elix Skipper defeat Dusty Rhodes/Road Warriors/Jeff Jarrett..
July 7, 2003: The Road Warriors defeated Shiro Koshinaka & Riki Choshu in Miyagi, Japan..
August 2003: Animal is now the defensive coordinator on the Minnesota Lumberjacks of the Mid American Football League..
April 23, 2004–Memphis Wrestling: Big Bubba Bain & Money Mike vs. Jerry Lawler & Road Warrior Animal ended in a double disqualification. May 4, 2004–IWA: Barry Windham, Mike Rotundo & Ryo Miyake defeated Animal Warrior, Jim Duggan & Keizo Matsuda. May 14, 2004–NWL: Road Warrior Animal and Pirate of the Carribbean defeated Leslie Leatherman and Gutterboy. July 18, 2004–AJPW: Bull Buchanan, Jamal and Taka Michinoku defeated Road Warrior Animal, Jim Duggan and Keizo Matsuda. August 21, 2004–Pacific Northwest: Road Warrior Animal & Critter beat Big Ugly JD Bishop & Jeremy Blanchard by disqualification..
September 25, 2004–Pacific Northwest: Jeremy & Bubba Blanchard b Animal & J.D. Bishop in a “First Blood” to retain the Tag titles..
October 30, 2004–U of Virginia Children’s Medical Center Benefit Show: Animal & Rick Steiner beat Warlord & Barbarian..
March 21, 2005: Joe “Animal” Laurinaitis had an off-screen tryout as an announcer at WWE RAW tapings in Birmingham..
June 2005 – Gladiator Championship Wrestling: Animal “showed up late” and got into a brawl with Warlord & Barbarian..
June 10, 2005 – NWA Wrestle Birmingham: NWA tag team champions Tom Prichard and The Assassin defeated Road Warrior Animal and Mike Jackson by disqualification to retain the titles. The WWE releases a Road Warrior DVD for which Animal is brought in to do a lengthy promotional tour..
August 4, 2005 – SmackDown! : Road Warrior Animal & John Heidenreich squashed Josh Daniels & Damian Adams. August 11, 2005 – SmackDown! : Road Warrior Animal & John Heidenreich squashed Scotty Sabre & Jason Static. September 23, 2005 – SmackDown! : The Legion of Doom (Animal & Heidenreich) defeated Anthony Collett & Jared Steele..
October 14, 2005 – SmackDown! : Mercury & Nitro & William Regal & Paul Burchill beat The L.O.D. & Psicosis & SuperCrazy..
October 22, 2005 – Velocity: Tag team champions Animal and Heidenreich defeated Paul Burchill and William Regal by disqualification. November 25, 2005 – SmackDown! : The Dicks beat The Legion of Doom by spraying baby oil in Animal’s eyes! January 13, 2006 – SmackDown! : Road Warrior Animal participated in a 20-Man Battle Royal for the World title (won by Kurt Angle)..
January 27, 2006 – SmackDown! : Road Warrior Animal said he wanted to win the Rumble at go to WrestleMania 22 in his hometown! January 29, 2006 – Royal Rumble: Road Warrior Animal entered at #19 but was eliminated by Rob Van Dam after only a few minutes..
March 3, 2006 – SmackDown! : MNM (Mercury & Nitro w/Melina) defeated Matt Hardy & Mystery Partner (Road Warrior Animal)..
~~~After the match, Road Warrior Animal confronted Matt Hardy and turned heel and attacked his already injured leg! March 10, 2006 – SmackDown! : Road Warrior Animal cut a heel promo putting down Hawk, John Heidenreich and Matt Hardy..
March 17, 2006 – SmackDown! : Matt Hardy defeated Road Warrior Animal in a Money in the Bank, Qualifying match..
March 31, 2006 – SmackDown! : WWE United States champion Chris Benoit defeated Road Warrior Animal in a Non-title match..
April 8-9, 2006 – House Show: The Road Warrior defeated Scotty 2 Hotty. April 14, 2006 – SmackDown! : Matt Hardy defeated Road Warrior Animal..
April 19-20, 2006 – House Show: Paul Burchill and William Regal defeated The Road Warrior and Orlando Jordan. May 5, 2006 – SmackDown! : Animal defeated Paul Burchill w/Shelly Martinez (try-out as Burchill’s pirates wench!) on VELOCITY..
May 5-6, 2006 – House Show: Gunner and Paul Burchill defeated Animal and Sylvan. 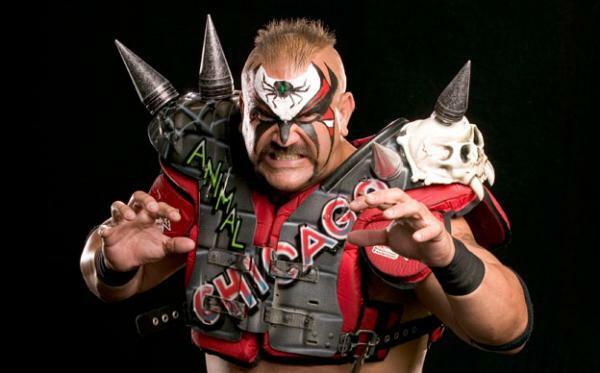 June 6, 2006: Road Warrior Animal was released from his contract by World Wrestling Entertainment..
Road Warrior Animal’s son, James Lauriantis, is a star linebacker for Ohio State University. September 1, 2007 – All Japan Pro Wrestling: Road Warrior Animal & Kensuke Sasaki defeated brother YASSHI & Shuji Kondo. May 11, 2008 – Toryumon: Animal Warrior and Power Warrior defeated Damien 666 and Damien El Terrible to win the tag team titles. July 20, 2012 – SmackDown: Road Warrior Animal defeated Heath Slater. October 21, 2018 – NWA 70th Anniversary Show: Crimson and Jax Dane w Road Warrior Animal defeated Crazzy Steve and Shannon Moore. @AndreaKenney28 @Wesbrisco @WrestlingAtomic @GarettBischoff @RWAnimal Hopefully some photo opps before and I’ll try for some good in ring action! 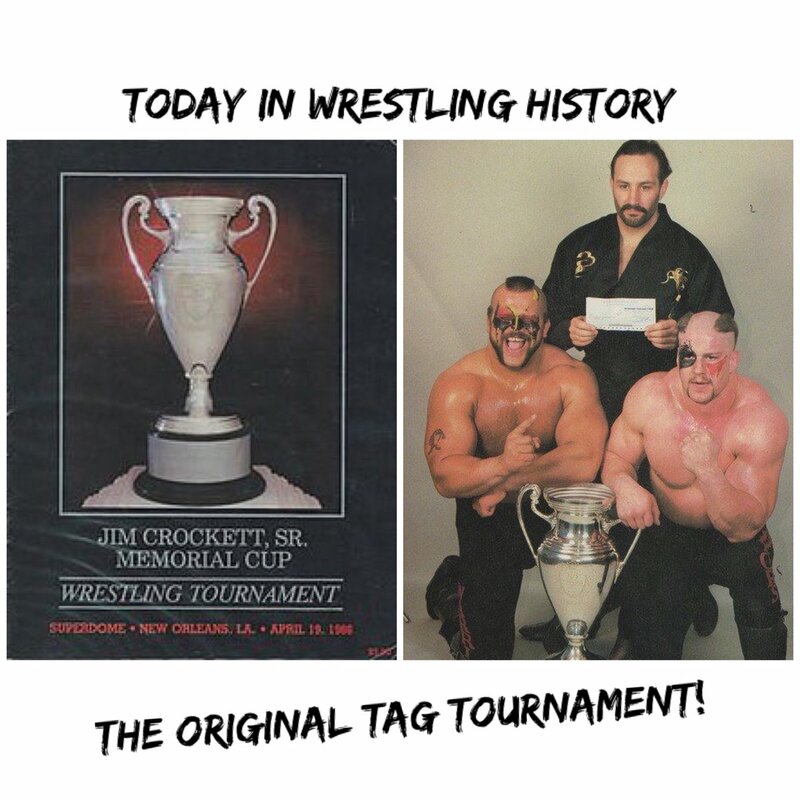 @SLTDWrestling @nwa @RWAnimal Greatest tag team of all time! In reply toMeltzer Said What? @MeltzerSaidWhat @ShamrockKen @RWAnimal 1997 was such a fantastic year for WWF. My favorite by far.